As durable as the Hyundai Sonata is, sometimes situations arise where you need to find Hyundai Sonata accessories or parts. Whether it is the result of an unfortunate accident or simple wear and tear, you want to make sure you get the right Hyundai Sonata accessories, parts to get everything working and looking the way it's supposed to. That's where UNeedAPart.com comes in. We specialize in finding exactly the part you need to make your or your customer's vehicle whole again. With access to over 7,000 parts dealers, finding the right Hyundai Sonata parts has never been easier. Plus, our dealers get the parts to you as fast as possible, because they know what it's like to need a hard-to-find part. If You Need Hyundai Sonata Parts, We Have Them! With a lineup of durable, hard-bodied vehicles, Hyundai Sonata offers a nice combination of traditional reliability with a more modern approach to style and design. 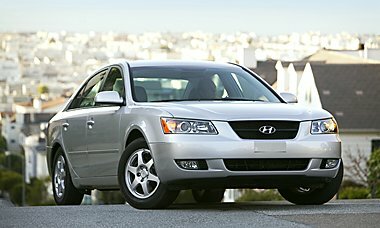 Hyundai Sonata parts are much more complex and can sometimes be very expensive if purchased from a dealership. UNeedAPart.com solves both availability and cost issues by incorporating a huge network of parts suppliers dedicated to getting the right Hyundai Sonata part to you. If you own an auto repair shop and you need a factory-built Hyundai Sonata radio, we can find it for you. If your customer's vehicle loses a hard-to-find Hyundai Sonata spoke rim, we'll find a parts shop that has one in stock. Did an accident ruin your customer's Hyundai Sonata bumper? No problem! Try us once and you'll see, you can't beat the selection, the cost and the speed of UNeedAPart.com! Finding the right Hyundai Sonata parts is easy! To get started, simply use the Parts Request boxes at the top and/or side of the page. You will instantly be matched with auto parts dealers that meet your search criteria. UNeedAPart.com helps you find the new or used auto body parts you need in no time!